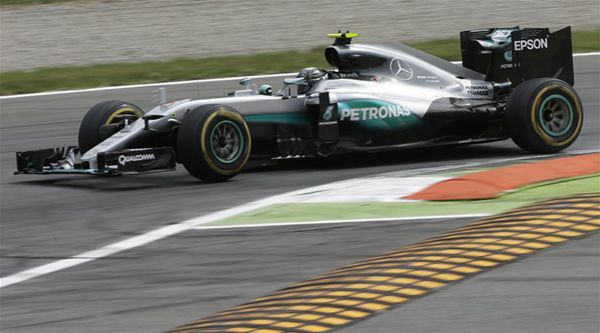 Nico Rosberg capitalised on a poor start from pole-sitter Lewis Hamilton to win the Italian Grand Prix at Monza. Nico Rosberg capitalized on a starting error by his Mercedes teammate Lewis Hamilton to win the Formula One Italian Grand Prix in Monza on Sunday. Hamilton was on pole but a poor start saw him drop to sixth as Rosberg, Ferrari's Sebastian Vettel and Kimi Raikkonen, Valtteri Bottas in Williams and Red Bull's Daniel Ricciardo all flew past him. Rosberg finished the race in 1 hour 17 minutes 28.089 seconds, 15 seconds clear of the defending three-time champion. Hamilton now leads the title race with 250 points ahead of Rosberg on 248. Daniel Ricciardo finished fifth for Red Bull ahead of Valtteri Bottas of Williams.